The spring 2015 eclipse season has begun! 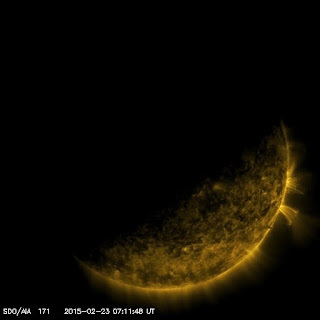 Yesterday at 0711 UTC (2:11 am ET) the Earth passed between SDO and the Sun. We can't see the Sun during the eclipse, but we do see interesting shapes as the Earth's edge moves past the Sun. The atmosphere of the Earth absorbs the extreme ultraviolet radiation from the Sun and emphasizes the bumpiness of the emissions. This eclipse season runs until March 17, 2015. SDO is in the News! The San Jose Mercury News had a front-page story about predicting solar flares. Drs. Bobra and Couvidat use many kinds of data, but rely heavily on HMI magnetic field data, to predict which active regions are about to have a flare. 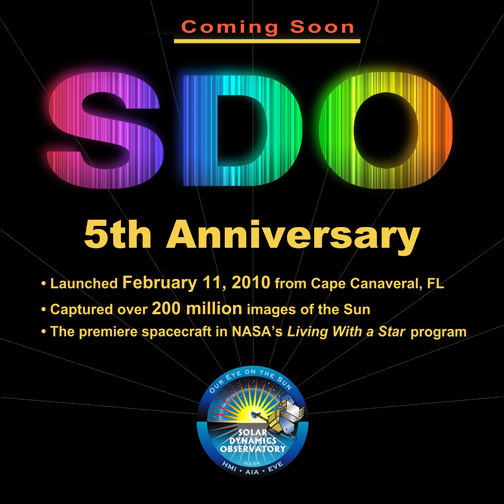 SDO's fifth anniversary was covered by a nice story on CNN. Congratulations Monica and Sebastien, and congratulations to the SDO team! SDO's 5th anniversary of launch was celebrated with the release of a Five year video by the GSFC Office of Communications. 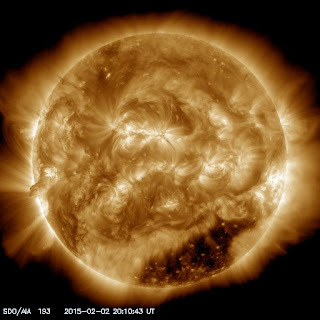 Another Space Weather spacecraft was launched yesterday. Welcome to the universe DSCOVR! Now we have two reasons to celebrate February 11. It is hard to believe that the SDO launch was 5 years ago! Tomorrow, February 11, is the fifth anniversary of the SDO launch. It was a cold day in Florida, but the SDO team in Greenbelt was suffering after 4' of snow! The launch was delayed because of winds on the 10th and then rose into the air at 10:23 a.m. ET on the 11th. After several weeks of trimming the observatory into an inclined geosynchronous orbit, the instrument doors opened and we began to see images of the Sun! Since the launch AIA has taken over 100 million images, with HMI not that far behind at 80 million. EVE has returned over 12 million EUV spectra of the Sun. There have been many science results, with over 2000 papers so far presenting SDO science results. My favorite observations include the trebuchet eruption, comets in the corona, and the Transit of Venus in 2012. SDO is a great observatory! How about 5 more years? Today, February 4, 2015, SDO performed two maneuvers, the EVE FOV from 1315-1557 UTC (5:15-10:57 am ET) and the HMI/AIA Flat Field from 1630-1907 UTC (11:30 am - 2:07 pm ET). During these maneuvers the images may be blurred or not in the center of the frame. 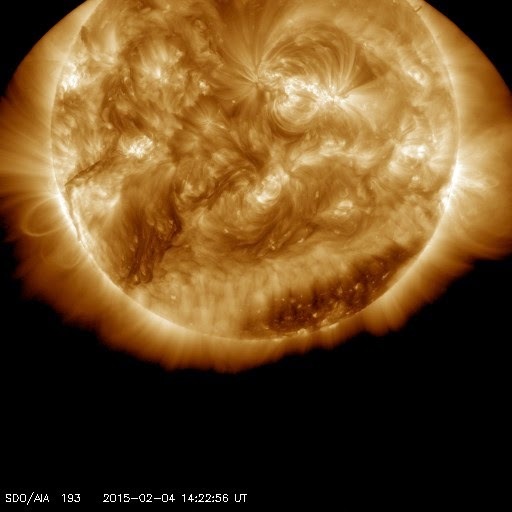 The AIA 193 Å shows SDO pointing a little below the Sun today at 1423 UTC (7:23 am ET). You can see the mask in the corners of the image. Once the maneuvers are complete the usual data taking will resume. Celebrate the "Year of Light" With a Beautiful SDO Image! UNESCO has declared 2015 as the International Year of Light. A story on CNN showed NASA images to celebrate IYL2015. One image was an AIA 193 Å image like the one at left. SDO is a great example of how astronomers use light to measure and understand our universe. AIA and EVE look at light from the Sun at very short, extreme ultraviolet, wavelengths. By comparing AIA images we can detect small motions of the corona. HMI looks at visible light. One nice property of light is that we can measure how it interacts with the Sun to measure things at the Sun that are otherwise difficult (if not impossible) to measure. We use the Doppler shift to see the wave motions and the Zeeman effect to see the magnetic field at the surface. Light is a wonderful thing!